Sree Ramamurthy, by profession, was a banker and an IT professional managing IT projects related to banking. He parted from a senior management level in an IT company to venture his own consulting and also to devote himself spiritually. This Translation of Lalita sahsranamam from Tamil version is one such cause. He started his career with a post graduate degree in Mathematics, but during his 34+ years of enriching professional journey, he has equipped himself with various degree/diploma/certificates in diverse fields like law (B.G.L. ), Banking (C.A.I.I.B. ), IT Audit(CISA), Project Management (PMP), Global Leadership (CGBL), Green and Black belt in Six Sigma, etc. and to top it all, at the age -of 55, he is actively pursuing research for a Ph.D. programme in a never ventured area linking Vedic Mathematics and Information Technology. His intellectual thirst for learning is barely quenched by these. The knowledge cycle starts with acquiring but is complete only when it is transmitted to others. Hence having acquired knowledge and gaining vast experience and expertise in varied fields it will not be complete without ‘sharing it. And what better way to share than teaching. Thus his passion for spreading the knowledge is also getting satisfied. To mention a few he conducts training programmes and plays the role of visiting professor for a couple of business schools. While one side of him uses latest gadgets and moves around with PDAs and laptops, his other side always is dedicated to gaining spiritual knowledge. Vedas, sastras and Samskrit language in particular impresses him. May be this is the reason for indulging in such an area for his doctorate research. He also actively participates in the activities of Rudra Pdrayana Samithi and co-ordinatesMahd Rudrams and Athi Rudrams. It is certainly this interest which has made him successfully write this book, but it is his humility that he attributes his success to everyone else. The author is a perfect example of the good old saying (Where there is a will, there is a way’. Even most of the profound literary scholars would have demurred at the thought of undertaking the herculean task of translating the ever increasing popular Tamil edition of Lalita Sahsranamam to English. But the author has taken this as an opportunity and a Deveene blessing and has managed to complete it almost with perfection. His qualities are comparable to that of Arjuna’s dedication, Yudhishtra’s righteousness, Veda Vyasa’s knowledge and Hanuman’s mighty power. Rightfully he is named after the legendary god Ram himself. The author with all his capabilities, devotion and the divine blessings of Sree Mata, managed to complete the translation within 9 months. He has used modern day tools like laptop and internet for extensive research in an effort to reproduce the Tamil version and at the same time retain its originality and flavour. The Hindu religious philosophy is so vast and contains so many masterpieces and treatises where each one is a deep ocean in itself. But there are many linkages between these gems of literary and divine masterpieces. In this work the authors of the original and translated versions have tried to provide some sneak preview into these linkages so that the readers, if not able to understand it fully, at least would be able to appreciate the essence. As Lord Sree Krishna himself said in Sreemad Bhagavad Gita, it takes several births before one is born as a human being by virtue of his past deeds, which brings him closer to God. As human beings, so blessed we are that we are one step closer to Devine which we canattain if we whole heartedly devote ourselves to God during our life time. By giving way to transient pleasures knowingly or unknowingly, we however move farther from God and salvation. It is therefore imperative upon everyone of us to purify ourselves and for this, as mentioned in Lalita Sahsranamaitself, there is no better way than uttering the divine names of Sree Lalita. It would even be more potent and effective, if we understand and import behind these divine names of Sree Lalita while chanting. It is towards this end that the author has made an effort to bring this rare work of art, where literature and divinity confluence and has translated into various languages from the Language of Gods, themselves-Samskrit. He had steadfastly worked on this spread over the past 9 months - not only translating the Tamil version into English but also finding out equivalent English words wherever Samskrit words themselves were used in the original Tamil version. 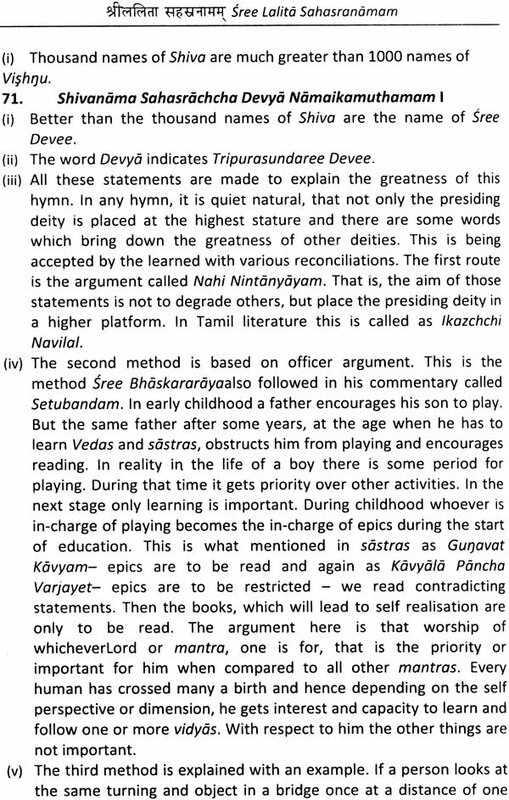 I am quite confident that this work is going to benefit a larger audience with different religious background through the medium of English and not being confined to Hindus only as the great work of Lalita Sahasranamam is meant to be for the welfare of the universal family (Vasudeva Kudumbam) as per the great Hindu tradition) !!! 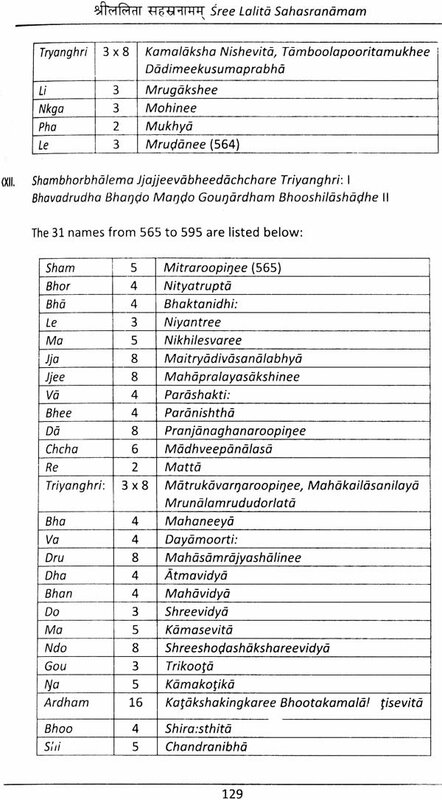 There are various Sahasranaama hymns about each of the Hindu Gods. Among them only two Sahasranaamas on Visnu and Lalitaa, are very famous. Visnu Sahasranaama forms part of Mahaabhaarataand it was told by Bheeshma to Yudhishtira and others. 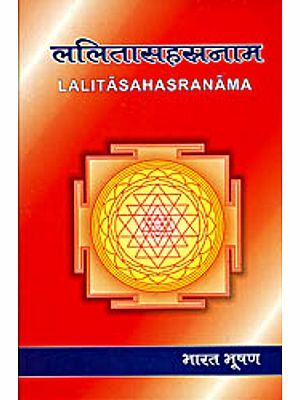 Lalitaa Sahasranaama forms part of the Brahmaando Puraana and it was told by Sree Hayagreeva to Sage Agastya. In this hymn itself, it has been stressed more than once that it is a very secret one and should not be told to ineligible persons. Hence this is not very popular like Visnu Sahasranaama among the common people. However, it is well known to those who follow Saakto principles and Devee worshippers. 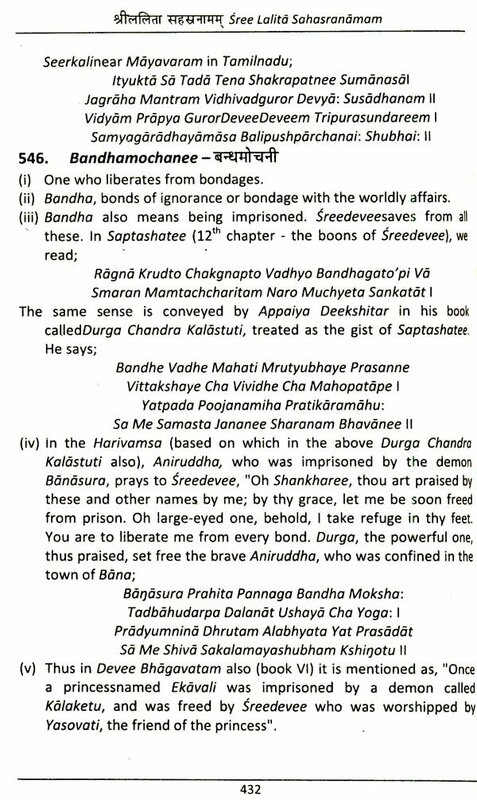 Sree Adi Sankara firstwrotecommentaryinSamskrit to visnu Sahasranaama. 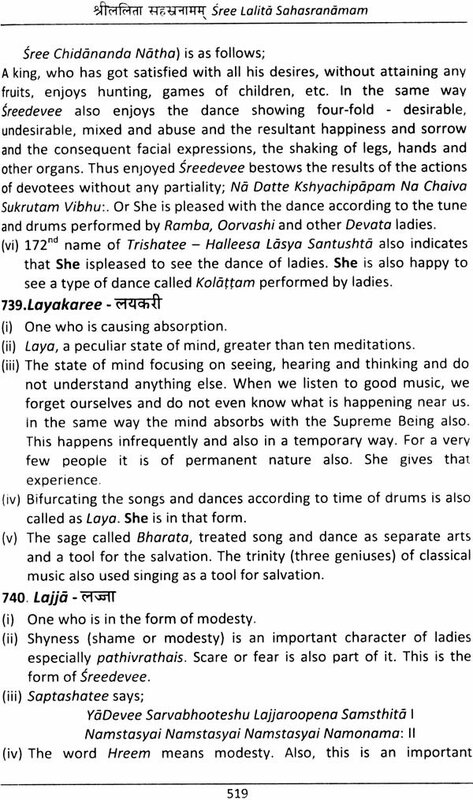 Sree Bhaaska-raraaya wrote the commentary in Samskrit to Lalitaa Sahasranaama. These commentaries are not just meanings, but research theses on those hymns. 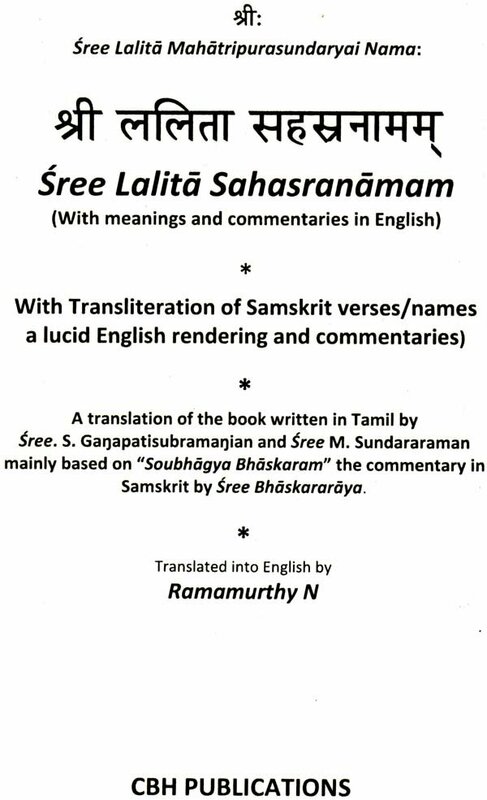 I went through the commendable work done by Sree Ramamurthy on Sree Lalitaa Sahasranaama with its English rendering. The specialty of this laudable work is a complete rendering into English of the Tamil work of Sree. S. Ganapatisubrarnarjian and Sree M. Sundararaman. This Tamil work was in turn based on the famous book “Soubhagya Bhaskaram”, the commentary on Sree LalitaaSahosranaama in Samskrit by Sree Bhaskararaya. The introduction and study part of the present work is unique and gives more details about the work and its implied meanings - not usually found in other publications. It is aimed it common audience and not necessarily scholarly readers. 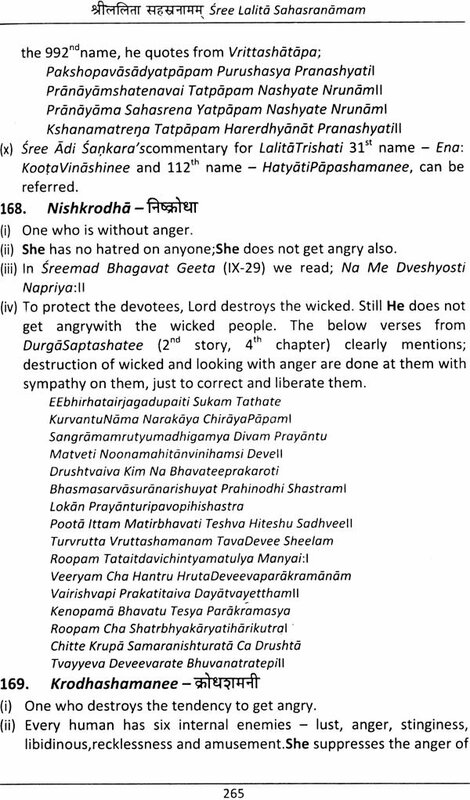 Every name in this Sahasranaama isloaded with a lot of inner mantras. 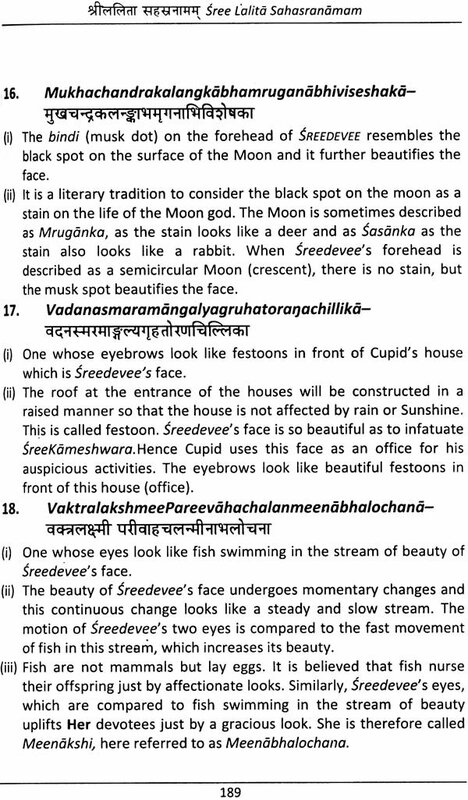 These cryptic inner meanings are explained in detail with comparison to other Puraanas, Upanishads, Sree Bhagavad Geeta, etc. 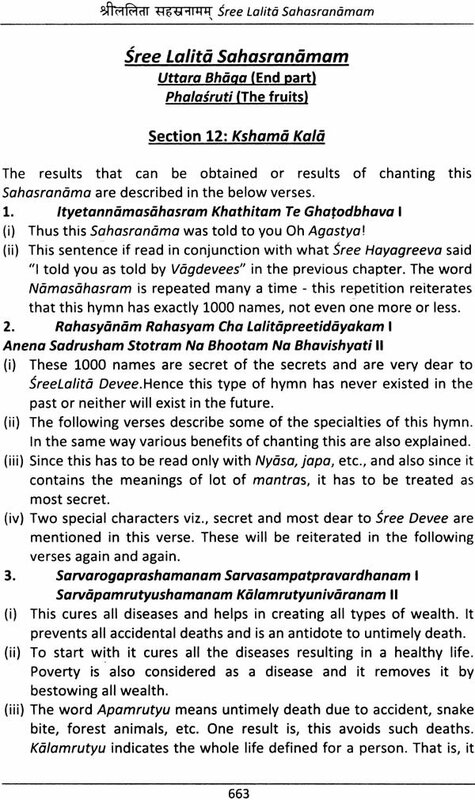 The Phalasruti part of this Sahasranaama explains in detail about various results or fruits that can be reaped by chanting these names. But if they are chanted, after understanding the inner meanings of them, definitely more benefits can be reaped. It is generally enjoined in the Upanishads that the performance of a brahmavidyaa or any other vidyaa is better done when performed after knowing its meaning as in “ya naachiketam agnim chinuyaat ya evam veda”, etc. This book helps the readers, to clearly understand the meanings, traditions / methods of performing worship, etc., in simple English. 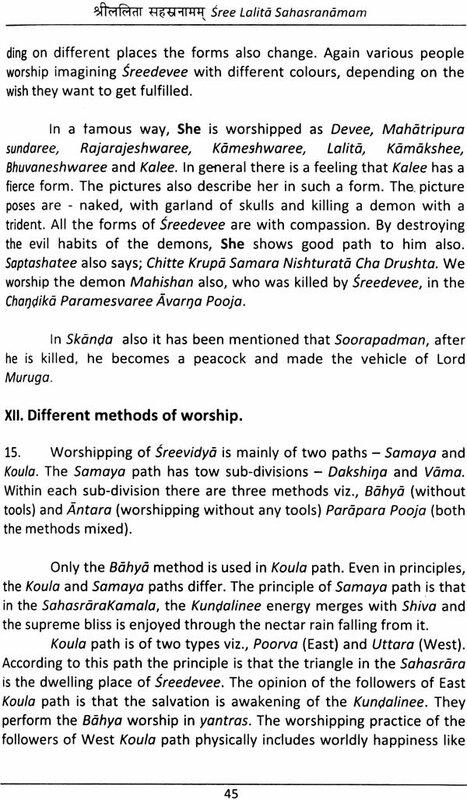 It also elaborates the details about Devee worship, Sreecbokra.Sreevidyaa, etc. 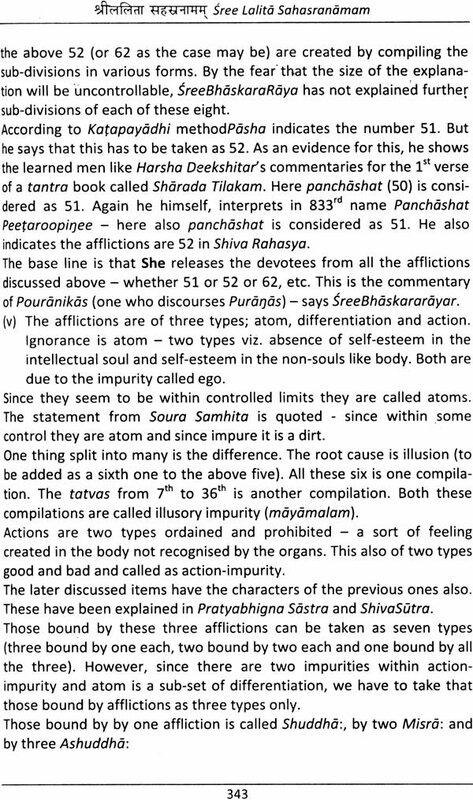 Especially the Paribhaasha verses are astonishing ones- the way they explain the unique method of splitting the verses into names. I understand, Sree Ramamurthy conceptualised this initiative in December 2008 and has completed the mammoth task in a matter around 9 months. 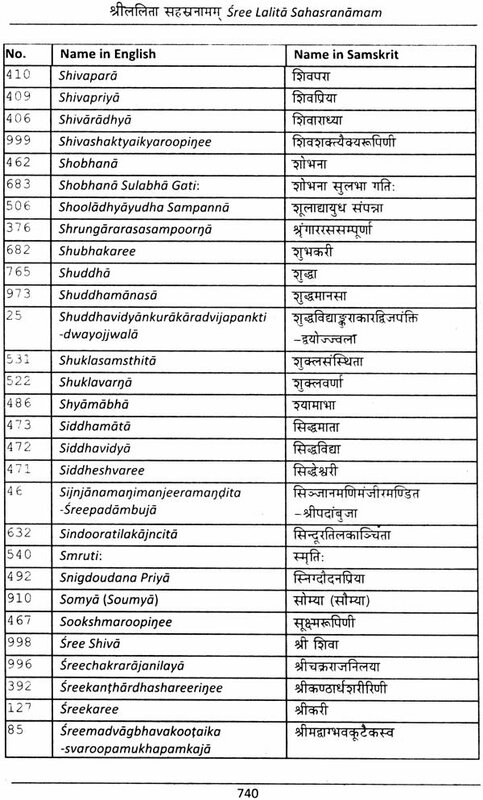 It is not only translating from Tarnil to English, but from Samskrit to English, since most of the Samskrit words are used, as they are, in Tamil. “Avanarulateye Avan Tat Vanangi” - to worship his feet with his own blessings is a famous Tamil saying. I am elated for the simple reason that the whole journey of writing this book was completed within 9 months from the time the idea was firmed up. But the fact is that we are all just a medium forHer, it was Her wish and thus it was destined to happen. It was She who has done it and She has used me as a tool. The original Tamiledition written by learned scholars, Sree S.Galnapati Subramarnian and sree M. Sundararamanof Gnana Bhaskara Sangarn; at the behest of their Guru (Sreemati PrakaasambaaSametha Sree Chidananda Natho) was first published in the year 2000. Since then it continued to have increasing popularity among the Tamil-knowing public especially those who have passion towards religion. But all its way through there were repeated requests to the author/ publishers from several quarters that the Tamil edition be translated into English for the benefit of the larger audience in mind. This formed the crux of this enthralling journey. There were so many roadblocks to overcome on the way some of which are worth mentioning for the reason that these could provide an insight and also a motivating factor for many a people who have passion to indulge in similar activities but are still thinking where or how to start. 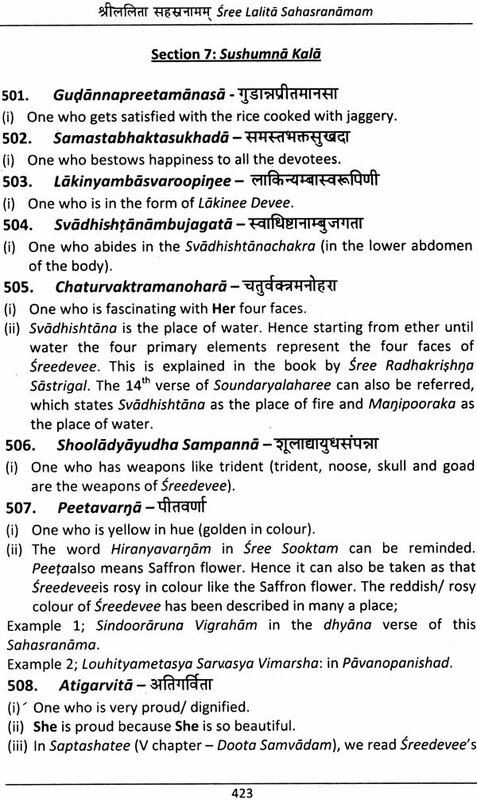 A lot many Samskrit words are used in Tamil as they are. In most of the sentences only the verb was in Tamil otherwise the subject, predicate and adjectives were all Samskrit words. Hence it ended up translating the words to English not only from Tamil but also from Samskrit. This was the biggest challenge. It is always difficult to translate the divine Samskrit language to convey the exact sense because of the fact that English is not exhaustive as Samskrit, whereas Samskrit is complex. As Mathew Arnold explained about the difficulties in translating the Bible from Hebrew to English, here also some of the expressions and phrases are notoriously untranslatable. In most cases, English is found wanting for communicating exactly some of the expressions or feelings, but similar limitations in Samskrit is a lot lesser. For instance there are no words/phrases communicating the exact meaning of the word Dharma. Hence a lot of search, research is required to convey the true sense for some of the words. Using tools like computers for directly translating instead of hand writing has helped in more ways than one. It has done a little part towards saving the Mother Nature by saving huge amount of paper work. Also the process of reviewing was much easier and so did the proof reading and subsequent corrections. Any number of such reviews and corrections were easily possible. I believe that justice has been done to whatever little possible work I have done and I do hope’ that the original book has been translated without losing its flavour. I have tried to maintain simple and easily understandable English throughout this edition keeping in mind an average reader. Hence I request the readers to take cognizance of any good messages conveyed rather the language used for it. Also I request them to notify of any mistakes so that it could be corrected in future editions. Of course, to read this book, the readers may have to have a little knowledge of 5amskrit, which could not be avoided entirely. But the effort required for learning and understanding it is miniscule when compared to the virtues we are getting out of it. 50 let us all put that small effort and seek Her blessings. 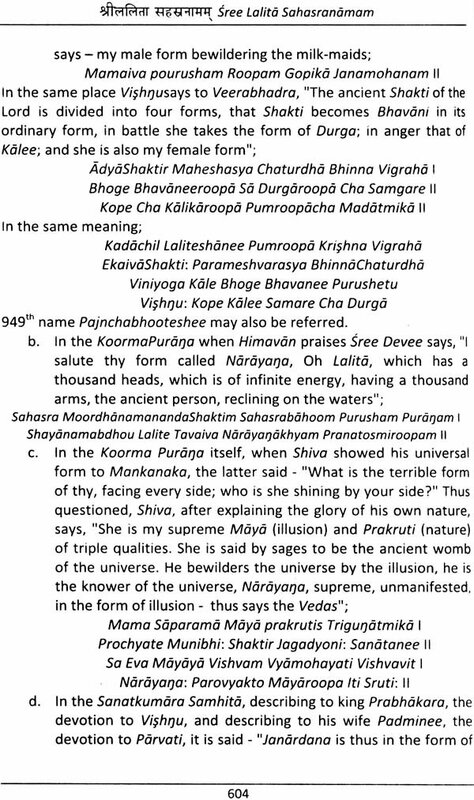 Lalita Sahasranama is a unique hymn in that Sreedevee who is extolled is not a sectarian deity, but the universal spirit who is the ultimate guiding principle of this universe. All the names are mellifluous and if chanted with an understanding of their meanings, they enable the devotees to attain remarkable peace and bliss. Sage Pathanjali says, Tat Japatas Tatartta Bhavanam - the name of a God has to be told after understanding the meaning and enjoying the same. A CD player plays the chant perfectly, but it will continue to remain as CD player and will never become divinised. Only a person who chants with faith knowing its meaning and focusing the awareness makes progress. Sree Bhaskararaya’s commentary helps the devotees to have an insight into the deep significance of each name. 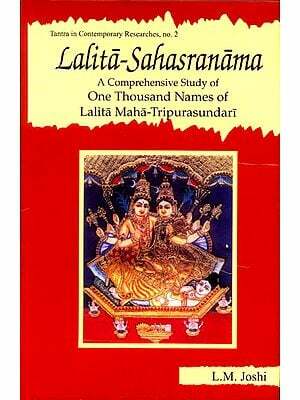 There are many books which provide meanings for Lalita Sahasranama in English. Then what is the specialty of this book? This is not just another book. In this page I try to explain in a nutshell, how different this book is and the research which has gone into this book. Sree Bhaskararaya was the first to write the bhasyam (commentaries in Samskrit) for ialita Sahasronoma. The magnum opus of the Tamil book was primarily based on this commentary, which has now been translated into English verbatim. Sruti and Smrutis, Vishn Sahasranama and what not. Just to mention the references, it has taken more than half the page. Hence to compare every name with these is more than enough proof to understand the effort that has gone into. For instance 71ih name EE has explanations/references running for 5 pages and the irony is that this is the smallest name and has got the longest explanation. The inner cryptic meanings, interpretations, etc., are also explained in detail. This stands as a testimony to the effort that has been put into bringing the best possible correct and truthful information. In addition to the commentaries for the 1000 names, the Tamil book has lot of information, must know details for every pious individual. Hence I have chosen to translate and provide here the entire introduction part including the publisher’s note, preface, etc., of the Tamil edition. Every one of the thousand names has got loaded with so much of mantras and inner meanings. 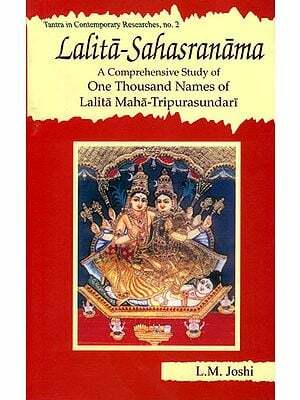 The forty verses called Paribhasha stotras is a self-contained research paper on Lalita Sahasranama. It is perfect allegory. At the outset the surface meaning of these verses is as praising and bowing Sreedevee. But the deep meaning is that, it explains the structure of all the thousand names-how many names contain how many letters, the following names start with which letter, the starting letter of every hundredth name, etc. It is a delight to read these 40 verses. However, it is very difficult to understand by oneself, without the detailed interpretations/ explanations given in this book. This is because the numerals are denoted by Samskrit letters and in cryptic method.